CARACAS - The head of Venezuela’s National Assembly asked U.S. authorities to investigate a $2.9 billion bond deal involving Goldman Sachs Group Inc. and Nomura Securities Co., saying the transaction fleeced the country for the benefit of political elites. 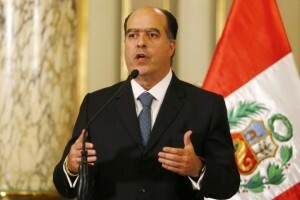 Julio Borges, an opponent of President Nicolas Maduro, addressed letters to the U.S. Securities and Exchange Commission, the Financial Crimes Enforcement Network and Financial Industry Regulatory Authority asking officials to undertake a probe. The letters were posted by opposition lawmaker Angel Alvarado, a member of the National Assembly’s Finance Committee. Borges has railed against the transaction since it was revealed late last month, saying that Wall Street banks were providing a lifeline to a despotic regime desperate for cash by purchasing national assets at fire-sale prices. According to the letter, Goldman Sachs paid just 31 cents on the dollar for bonds from the state oil company with a face value of $2.8 billion that had been held by Venezuela’s central bank. The price was more than 10 cents less than what similar notes were trading for at that time, according to Borges. In a detailed account of the transaction carried out in late May, Borges says that “it is our understanding that there is enough evidence of wrongdoing for the U.S. government to start an investigation against Goldman Sachs and Nomura” under the Foreign Corrupt Practices Act. Borges says the assembly has obtained documents that show Venezuela’s central bank board approved selling the bonds originally issued by Petroleos de Venezuela SA. They were first bought by Commonwealth Bank and Trust, which then listed them for sale using Dinosaur Merchant Bank and Midclear SAL as intermediaries. Commonwealth Bank and Trust is based in Dominica, Dinosaur Merchant Bank in London and Midclear SAL in Lebanon. However, “according to numerous sources, the ultimate beneficiary owners of all three institutions are Venezuelan citizens with a history of carrying out corrupt business with the Venezuelan government and its officials.” The letter doesn’t provide the names of the citizens. Commonwealth, Nomura and Midclear didn’t return emails and phone calls seeking comment on their role in the deal. Dinosaur declined to comment. Goldman Sachs’s asset management unit, which bought the securities, has said it didn’t have any direct dealing with the government and has denied any wrongdoing. Andrew Williams, a spokesman for the bank, didn’t immediately respond to a call for comment on Borges’s letter. Borges said Nomura also bought $100 million of the same bond at the same discount. In the two days after the purchase by Goldman, Venezuela’s international reserves increased by only about $750 million — which Borges said implies a substantial, above-market fee paid to the broker. The money paid by Nomura is also unaccounted for, he said. In total, Borges says there’s $150 million that’s missing. Reserves were $10.15 billion as of Tuesday. In April, Venezuelan lawmakers reached out to big Wall Street firms including Goldman Sachs, asking them not to help the country monetize $7.7 billion in gold reserves. In an editorial May 26 , Harvard University economist Ricardo Hausmann — a former planning minister in Venezuela and long-time critic of the current government — called on JPMorgan Chase & Co. to remove Venezuela from its bond indexes so investors tracking the gauges aren’t compelled to buy those notes.